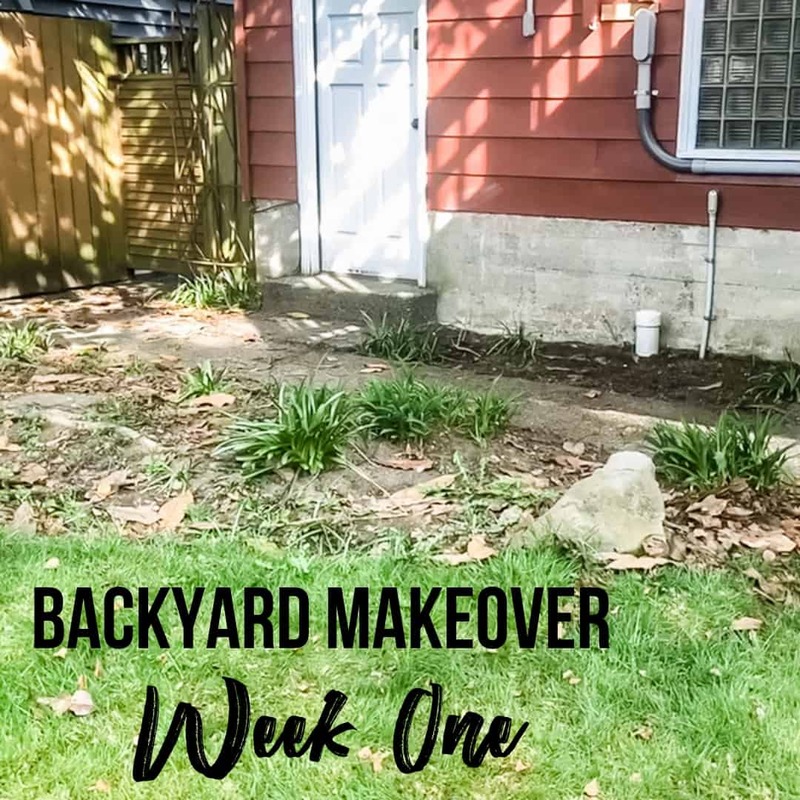 Follow along as I tackle my backyard makeover over four weeks! 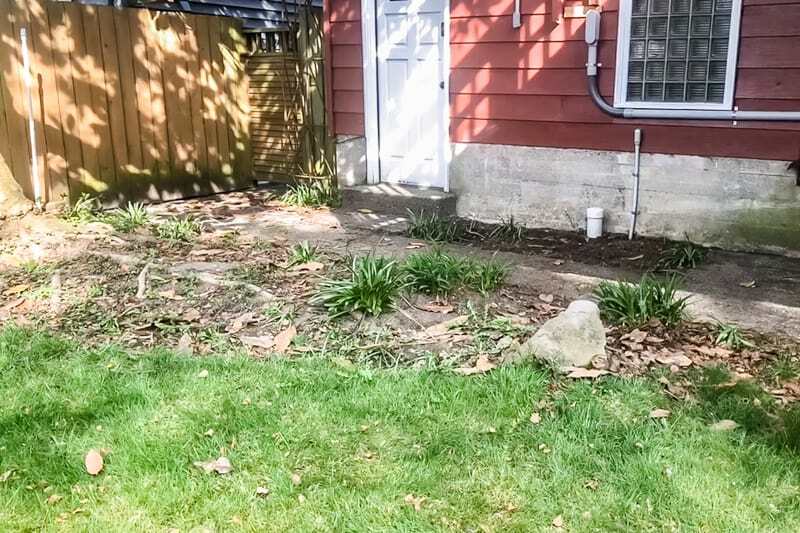 You won’t believe the transformation of this neglected corner into a pea gravel patio with propane fire pit! Our family spends a lot of time outside during the summer, but we don’t use our backyard to its full potential. This spring, I’m giving one corner of the yard a complete overhaul to put it to good use! 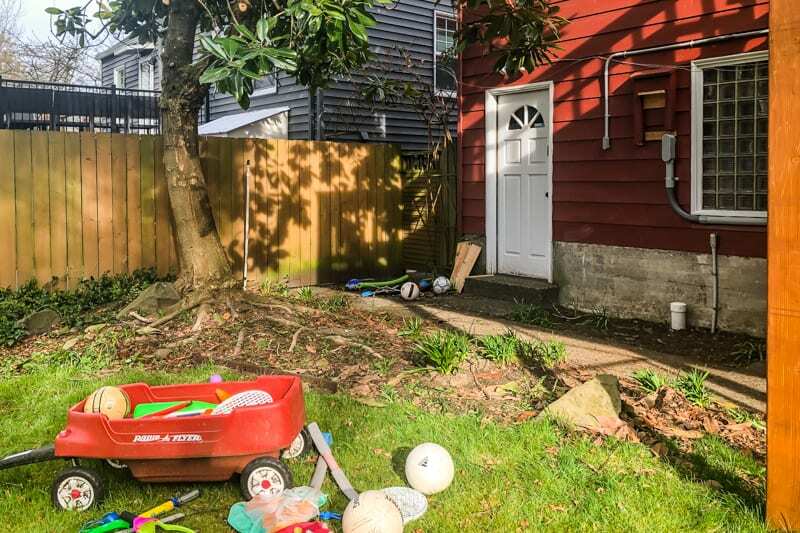 What was once a dumping ground for toys, gardening tools and junk will soon be a pea gravel patio with propane fire pit and seating for all our friends and family! 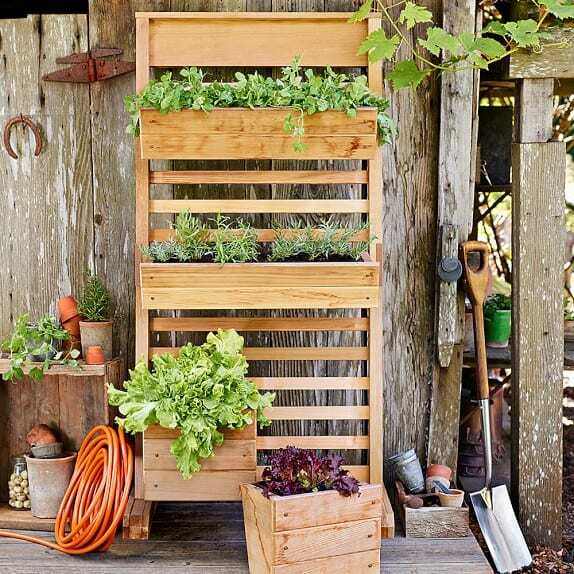 This post is sponsored by Ryobi Outdoor and contains affiliate links for your convenience. Purchases made with these links may earn me a small commission at no additional cost to you. Over the next four weeks, I’ll be digging, building and planting to turn this dark, dirty corner of our backyard . . .
into a fun hangout spot that we’ll use all summer long! Inspired to give your own yard a new look? 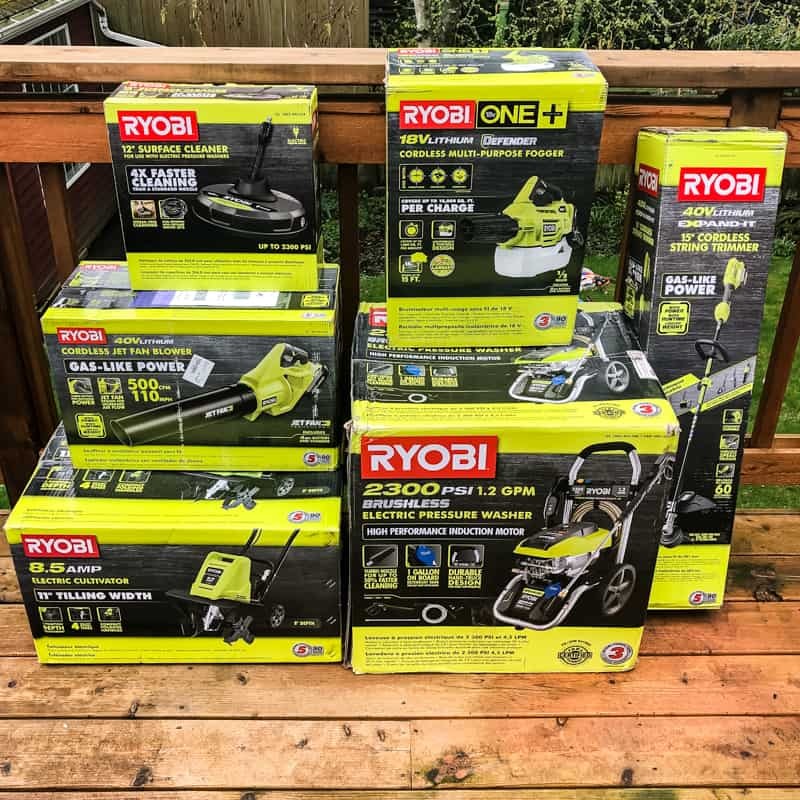 You’re in luck, because Ryobi is giving away one landscaping tool each week, plus $500 in outdoor tools to one lucky winner! Scroll down to the bottom of this post for all the details. I have BIG plans for this area of the backyard, but there are a few challenges to overcome. 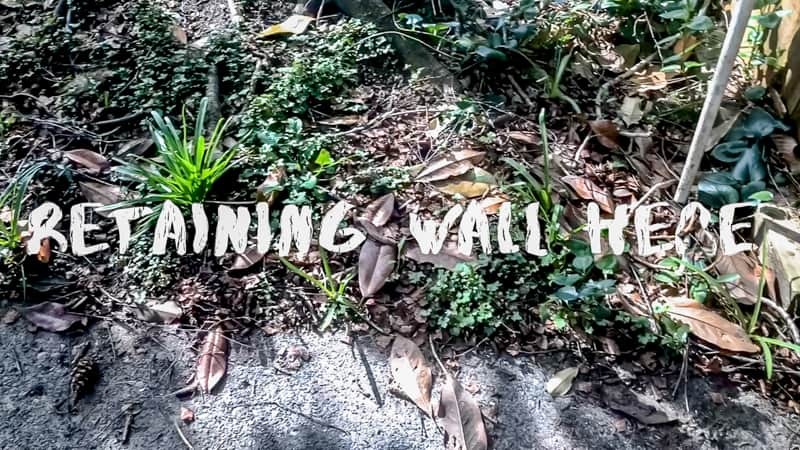 You can check out my full walkthrough of the space in the video below. With the deck on one side and a huge Magnolia tree on the other, this area is always in the shadows. As a result, everything I’ve planted in the past has struggled to survive. I’ll be trimming the lower branches of the tree with the Ryobi 40V pole saw to allow more light to shine through, and to give us more head room. Instead of planting more flowers that are doomed to fail, I’ll focus on shade-loving plants like ferns that will thrive in this corner. I plan to transplant some of the ferns I divided last year into the space so it doesn’t look so bare. To brighten up the patio at night, I’ll string lights throughout the tree and replace the old security light fixture with a new one with built-in outlets. When we first moved into our house, the electric meter was in this back corner and framed into the siding. 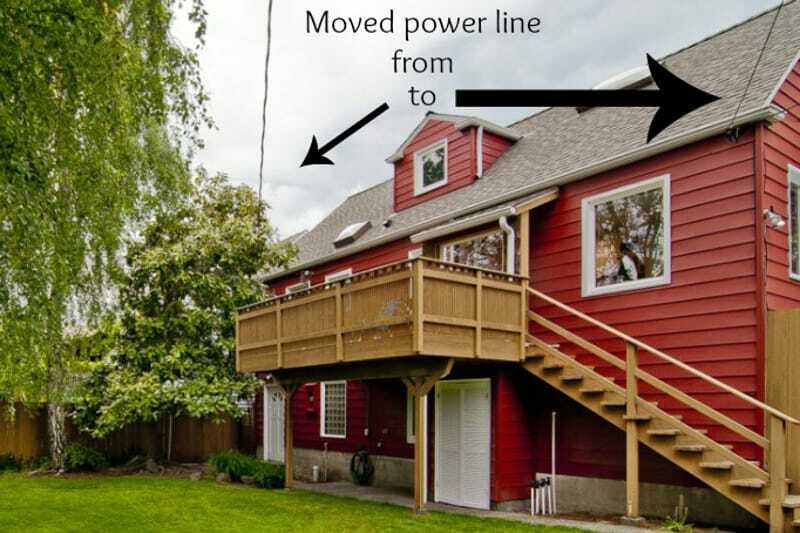 We rerouted the main power line to the side of the house so it didn’t droop over the deck, and moved the meter to the alley. We were left with an empty frame and a big hole in the side of the house! 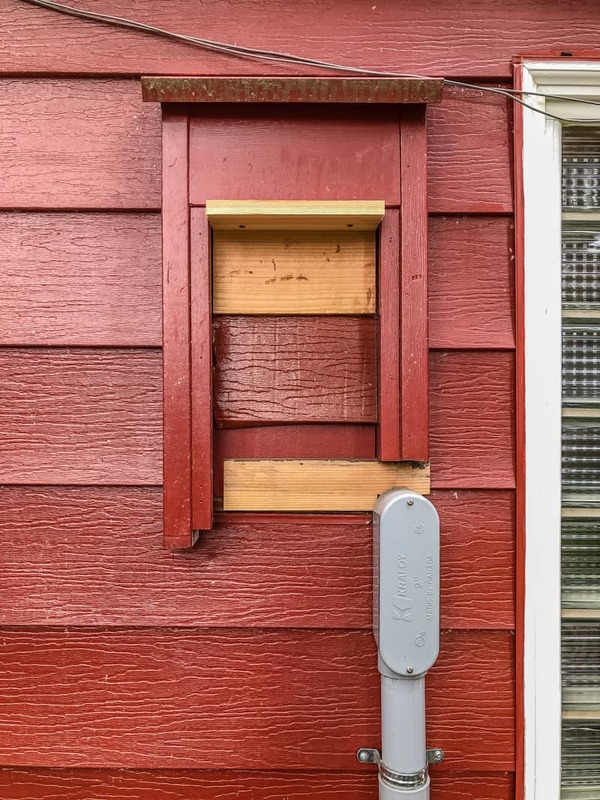 I quickly covered the exposed parts with cedar and a scrap of siding so nothing could get in, then pushed it to the bottom of the to-do list. I’ll patch the siding correctly next week, but that still doesn’t solve the problem of all that ugly conduit! Painting it red to match the house will help camouflage it a bit, but I plan to hide it all behind a tall planter wall like this one instead. It’s no secret that Seattle gets a lot of rain. 🙂 All that water can erode a garden bed in no time, like under our Magnolia tree. Over the summer, this tree loses a LOT of leaves and creates a big mess! My theory is that the roots get too dry during our rain-less summers because there’s no dirt to hold in moisture. 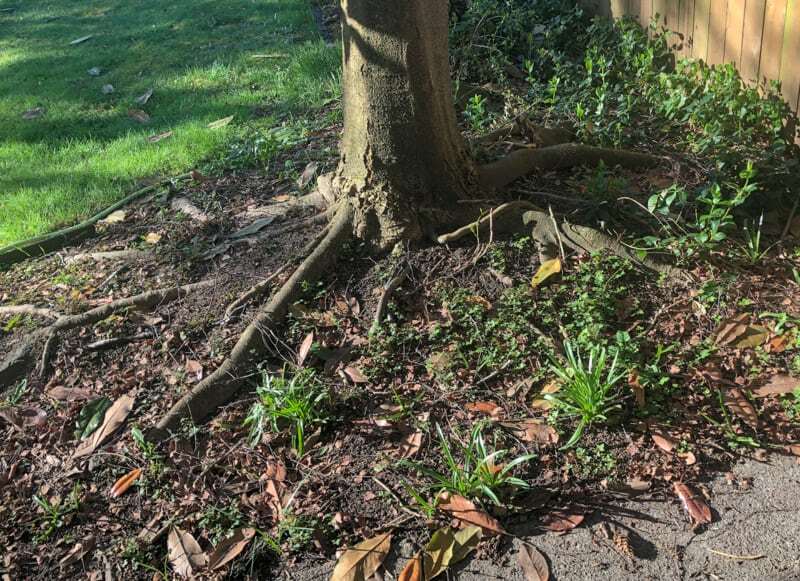 I’ll build a short retaining wall along the concrete path and backfill this corner with new garden soil to help this tree survive. All those weeds and vines aren’t helping matters either, so I’ll whack them down with the Ryobi string trimmer. Then I’ll clear away all the debris with Ryobi’s new Vac Attack leaf vacuum mulcher and put down a thick layer of mulch to prevent them from coming back. 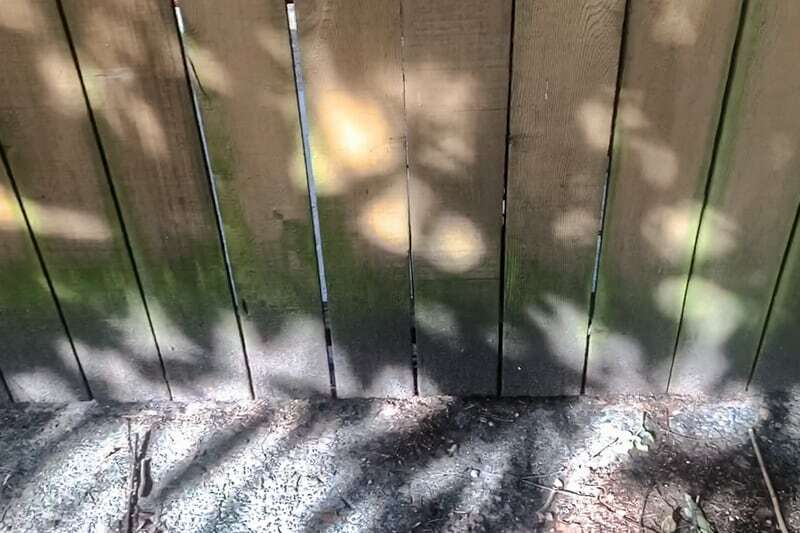 It’s always a challenge to keep moss and mildew under control in the Pacific Northwest! This corner hasn’t been cleaned in years, and there’s a film of green over the entire area. Ewwww . . .
I’ve used a small power washer in the past to clean our deck, but it wasn’t up to the task here! 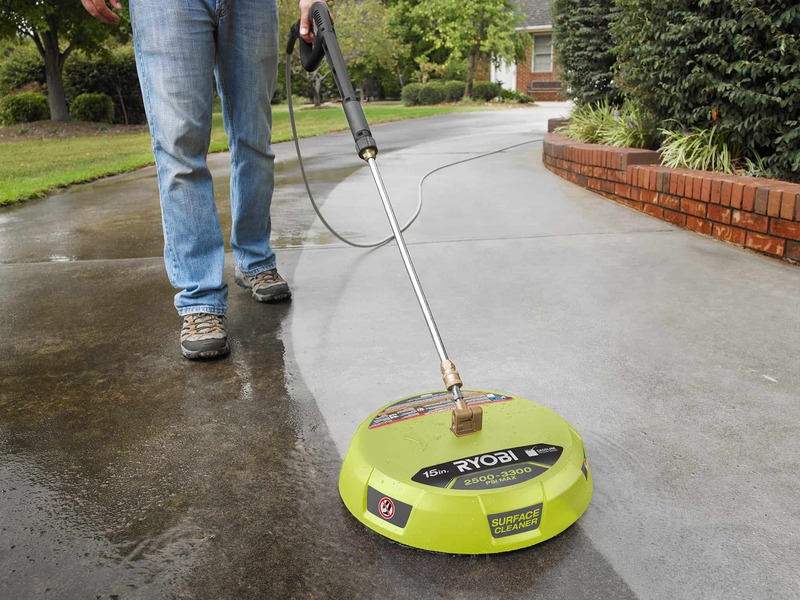 The Ryobi 2300 PSI electric power washer will easily tackle this grimy concrete walkway and dirty fence and make them look like new! I’m especially looking forward to trying out the surface cleaner rather than that tiny spray nozzle I was using before! Instead of struggling with grass and plants that won’t grow, I’ve decided to convert the area between the Magnolia tree and the deck into a pea gravel patio. I’ll till the soil with the Ryobi cultivator to make it easier to level out. 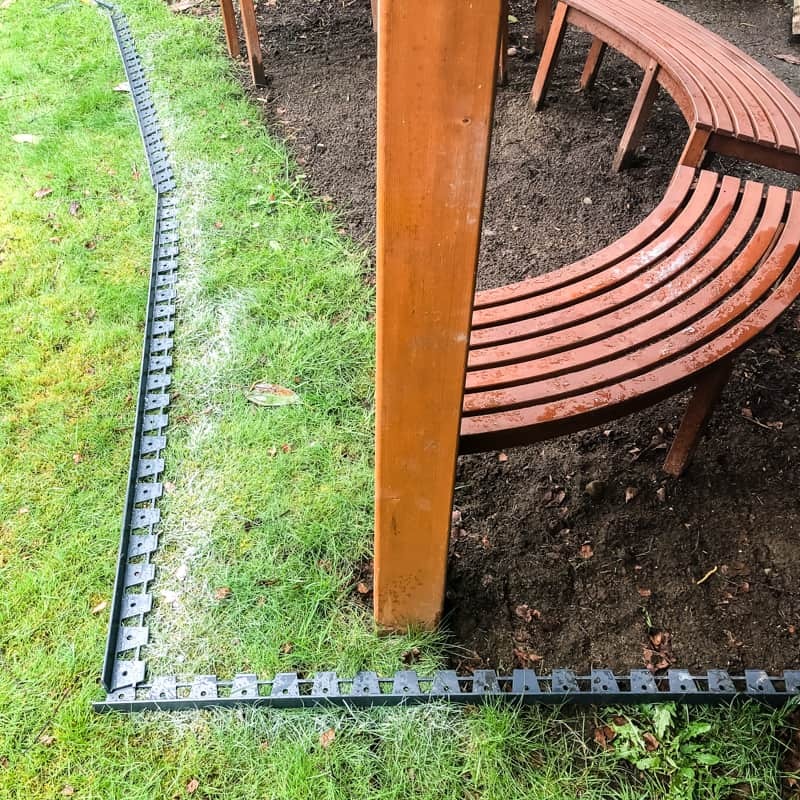 To prevent gravel from migrating into the grass and causing problems for our Ryobi electric lawn mower, I’ll create a perimeter border with cobblestone pavers. This will define the space and hopefully keep most of the gravel in place. I bought these curved benches ahead of time to test out the spacing of the new patio. They’ll provide open seating around a small propane fire pit. I can’t wait to roast marshmallows on a cool summer night! As you can see, I have a lot of work to do! But I’m thankful that Ryobi is providing me with all the tools I need to get the job done right! I’m teaming up with three fellow bloggers to whip our outdoor spaces into shape. Follow along with Wendi from H2OBungalow, Serena from Thrift Diving and Gail from My Repurposed Life to see how each of our backyard overhauls turn out! Is your own yard in need of a makeover too? Then head over to my Instagram page every Monday and enter to win one of the tools we used to whip our outdoor spaces into shape! 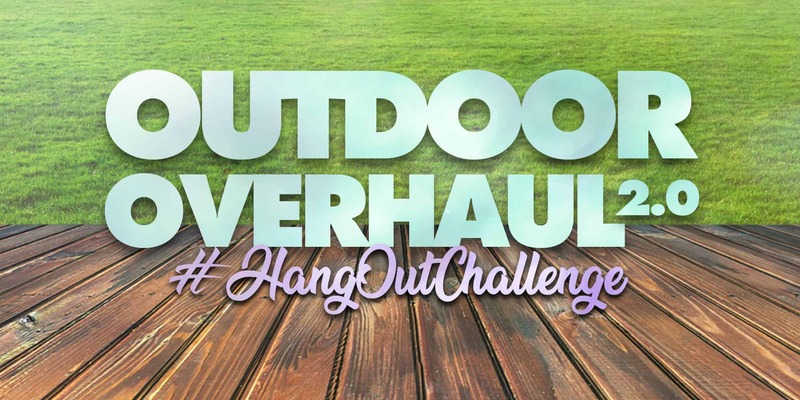 Just repost the Outdoor Overhaul 2.0 #HangOutChallenge photo on your own Instagram page with the appropriate tags. Better yet, if you post before and after photos of your own outdoor overhaul on Instagram with the tags listed below, you’ll be entered to win $500 in Ryobi outdoor tools! Get a reminder delivered to your inbox every week! Just subscribe to my newsletter and I’ll make sure you don’t miss an entry! I can’t wait to follow along with your outdoor overhaul! You have grand plans and it sound fabulous! It’s going to be amazing! I can’t wait to see it come together! I am very interested in following your makeover of your backyard bescause I am looking to update and make my backyard an outdoor place to enjoy year round. I am pumped to see what you improve. Thanks to you and Ryobi, i might win the tools and equipment I need to succeed.